For some, Kenya’s election re-run day will forever be remembered for the sting of tear gas in the air, the thuds of rocks striking rooftops and rubber bullets fired skyward. A day set out in the constitution to give Kenyans the right to express their freedom of choice, was instead marred by isolated protests and low voter turnout. Our coverage began at a polling station on the outskirts of the Kenyan capital’s infamous slum, Kibera. The station was a tented set up, surrounded by armed guards – when we arrived at 8:00am, an hour after polls opened, there were no voters. The rain the night before had torn up the ground, turning each voting stream into a swamp. We watched a few voters – walking with their heads down – navigate their way to the ballot boxes. All declined to be interviewed on camera. 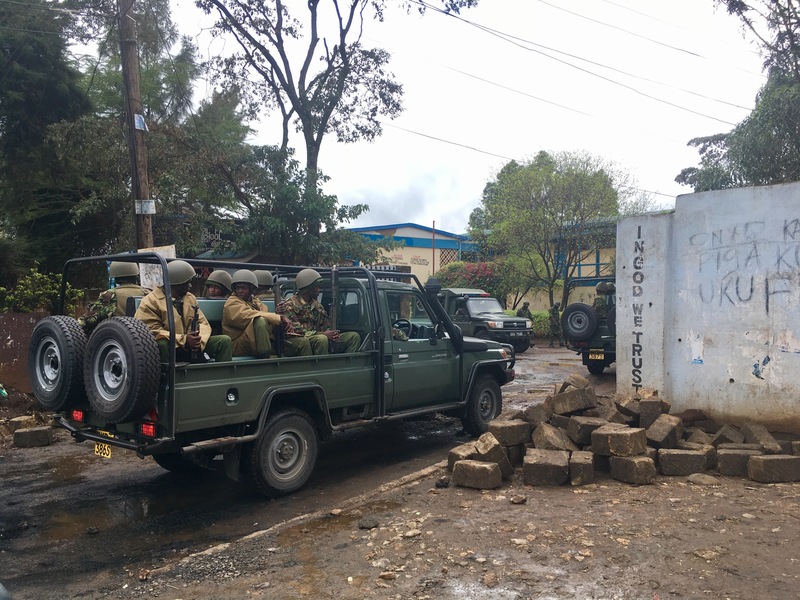 There was news that one of the polling stations deeper in the heart of Kibera, Olympic Primary School, had been barricaded by protesters and all Independent Electoral and Boundaries Commission (IEBC) officials had been forced away. Home to just under 200,000 (2009 Kenya Population and Housing Census), the usually crowded streets of Kibera were empty. Tight-roads were full of broken glass, burnt tree branches and bricks set to form as hurdles for any police units. 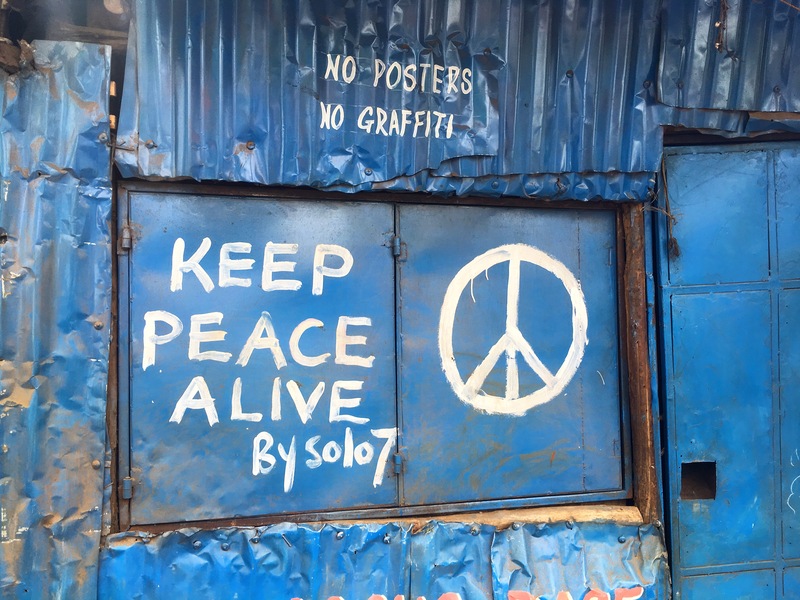 All shops had shut, all homes were locked – many now bore graffiti marks, “Keep Peace Alive, by Solo7”. It was a war zone, now. Heavily armoured police vehicles had pushed on through the bonfires, and specialised units were patrolling the streets with guns. Walking through, you could hear screams somewhere in the slum, and the echo of tear-gas canisters exploding. Locals who had stayed in the area were huddled in groups under cover of corrugated iron rooftops, holding their hands up whenever police looked their way. We were less than one kilometre from the previous station, but it was enough to see the atmosphere completely change. As we neared Olympic Primary School, the volume of police grew greater, and so did the noise. The police were organised in tightly-knit units, or waiting in the back of vans. Olympic Primary School’s gate, which had originally been barricaded by a trailer, padlocks and large bricks, had been knocked open by police who were keen to get the station up and running. The shouts from protesters grew louder as they teased the police by coming within one hundred metres of them, throwing rocks, and then running back into the dens as tear gas was fired. As the wind blew the gas back our way, it stung the eyes of CGTN‘s Political Correspondent, Robert Nagila, myself and our cameraman, Sammy Koech. Olympic Primary, as a polling station, was still not functioning and we had to cower under the classroom roof as rocks were constantly being hurled at the school – some even said that the protesters were now using slingshots. A school on Tuesday – now Olympic Primary was the centre of a tense stand-off between police and protesters. The protesters keen to close the station, the police ordered to keep it open. On the school football field, police, along with specialised units, were carefully watching a wall that had been kicked down. This was a new form of entry for the demonstrators, and from time to time they would come up to the field and chant or throw stones, before police would chase them away. It was cat and mouse, and the process was repeated over and over until police got tired and brought in the heavily-armoured water cannons. 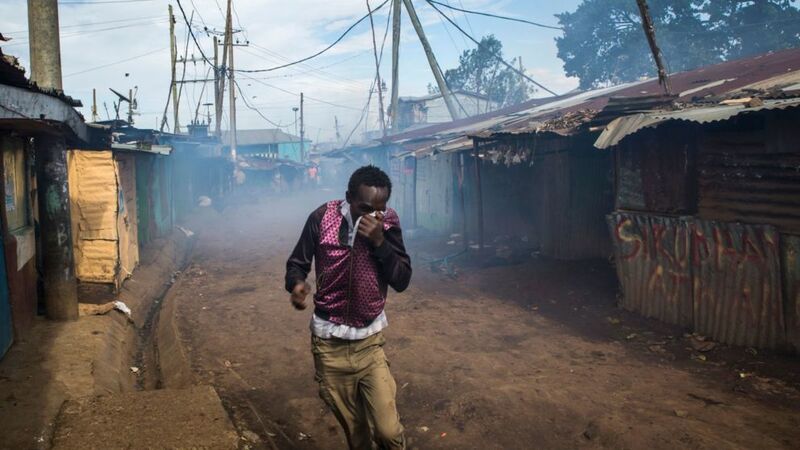 In the strait-winding streets of Kibera, the police advanced armed with rubber bullets and tear gas, as demonstrators hid in enclaves – they had succeeded in their aim, to deter voters in the area from voting. As the ballot papers were unloaded from Matatus in boxes to try and open the station, it was clear that any of them being signed would be unlikely. In Kilimani, a typically middle-class area of Nairobi, the scene was completely different. Although the turnout was still low, the stations were well-ordered and functioning. An IEBC official claimed that thousands had voted here, but at two hours before polls closed, many of those on duty were relaxing with tea as single-voters trickled in and out. Even observing the counting of the votes, it was clear that less had cast their ballot. An exercise that before took a number of hours, was reduced to little over an hour – and as we were leaving around an hour after polls had closed, the boxes were being taken to headquarters, fully counted. Much uncertainty still surrounds the next step of this election process – how long it will last, what drama will play out. For the many Kenyans that we spoke to, they called for peace, for the two main parties to exchange dialogue, and for all of this to be over.